Today, there are no clues that a station ever existed on the site which was once Rosherville. 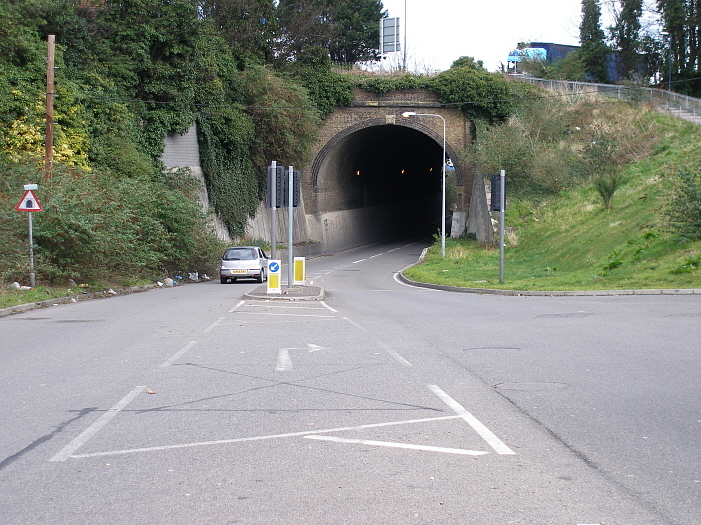 Only a tunnel, now used by the access road to the ‘’Imperial Retail Park’’, exists as an indicator of the former branch line to Gravesend West. Briefly recapping, the £250,000 double-track line from Fawkham Junction was built under the guise of the 1881-formed ‘’Gravesend Railway’’, a LC&DR-instigated company. Officially declared open on 17th April 1886, even though passenger services did not commenced until 10th May of that year, the branch provided the LC&DR with a 27½-mile link between Victoria and the Thames estuary town, which compared unfavourably with the SER’s already-established mileage of 24 from Charing Cross. Nevertheless, this was an interesting appendix of the ‘’Chatham’’ main line, just under five-miles in length and eventually comprising of no less than four stations. The intermediate stops which opened with the route in 1886 numbered two: Southfleet and Rosherville. The pair shared two significant characteristics. Firstly, both sites were situated within a cutting, requiring ‘’high-level’’ access. Secondly, the two stations were of a single island arrangement, the double-track widening to accommodate the platforms. However, this is where the similarities stopped, and hereafter architectural parallels can in fact be drawn between Rosherville and Gravesend (C&D) stations. The main building at the former was situated on the ‘’down’’ side and, as aforementioned, was built in an elevated position, the running lines being situated in the below cutting. The building, single-storey with a pitched-roof and demonstrating the LC&DR’s familiar arched window frames, can quite accurately be described as a scaled-down version of the main structures once in evidence at the Gravesend terminus. The company’s seemingly trademark crème brickwork was used throughout construction, complete with orange edge lining. The main entrance achieved an imposing air, incorporating an arched doorway complete with a prominent pitched-roof section overhead. These exact characteristics had also been implemented at the pier station, but the site at Southfleet had foregone any such structural elaboration, the platform-level building at the latter being a more conventional affair. Connecting Rosherville’s main building with the below platform was a fully enclosed footbridge of pitched-roof design. Its appearance was virtually identical to the structure still in evidence at Albany Park, despite the fact that five decades separate the two sites. On reaching the island, the footbridge split into two flights of stairs, these being Fawkham and Gravesend-facing respectively, and protection from the elements was met immediately on reaching the platform surface. Two canopy sections were installed here, each separated by the centrally-positioned footbridge. Elaborate wrought-iron struts supported standard pitched-roof wooden canopies, again identical to those implemented at the pier station. Fortunately, examples of the intricate supports still exist today: a number were saved from the terminus station in 1986 by the North Downs Steam Railway Society. These have subsequently reappeared at the new Groombridge station, on the Spa Valley Railway. Although the layout here was somewhat simple, combined with the fact that the station resided no more than a third of a mile from the end of the line, Rosherville still commanded its own signal box and Station Master’s house. With reference to the former, this existed on the ‘’down’’ side, to the south west of the footbridge. Two storeys high, it was of the LC&DR’s own in-house design and was built into the side of the cutting. 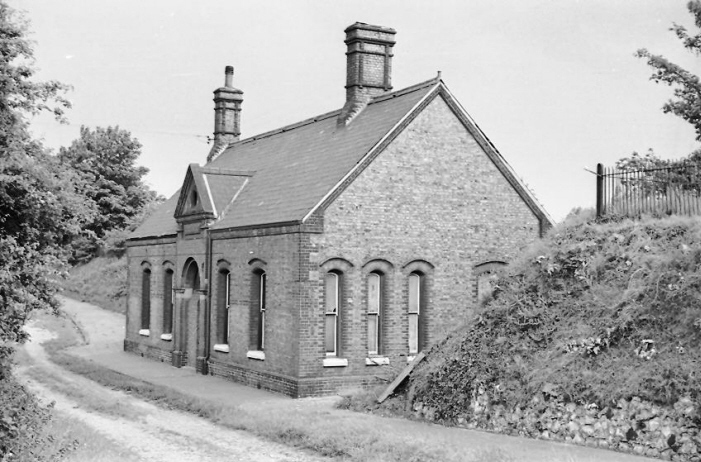 Conversely, the Station Master’s house resided at the same level as the main station building, although again to the south west of it. Southfleet also boasted a Station Master’s house, this too being in an elevated positioned relative to the running lines. The structures at either site were virtually identical in appearance, being two-storeys high with prominent pitched-roof sections, in addition to demonstrating the same yellow brick construction. That at Southfleet remains in existence today, as a reminder of the example once in use at Rosherville. The SER’s Gravesend station had three distinct advantages over its LC&DR rival. Firstly, it was the longest-established site, having come into use in 1849. Secondly, the station was the most convenient for the town centre, being located central to it. Thirdly, the platforms had been on a through route which, since 1856, extended down to Maidstone and, ultimately, the SER trunk line at Paddock Wood. However, the Branch line did have a couple of factors in its favour. These included a connection with ferry services at the pier station, but also of prominence was the station serving the adjacent Rosherville Gardens. The landscaped expanse, opened in 1840, existed just to the north of the LC&DR’s intermediate station, and traffic carried for the gardens during the line’s first year of existence was considerable. However, the receipts were not to be sustained, and both the station and Rosherville Gardens were to witness decline so severe, that the latter would be subject to closure in1900. Despite this, the SE&CR decided to perpetuate with the station, and although Rosherville gardens reopened to the public in 1903, there was no sign of a revival of the traffic levels experienced during 1886. Indeed, the gardens again fell foul to limited interested, closing for the last time in 1910. The need to encourage local traffic on the Gravesend branch line became increasingly apparent under SE&CR auspices. In the early 20th Century, this company began a network-wide policy of attempting to boost passenger numbers by opening small halt-type affairs. This was evident on the Gravesend West branch where, on 1st July 1913, Longfield Halt came into use, just beyond Fawkham Junction. This would not remain as the line’s only stop to be referred to as a ‘’halt’’, however….. Cost cutting measures emerged under Southern Railway ownership, when Rosherville was relegated to ‘’halt’’ status on 17th June 1928. Staffing of the station had ceased, and the nameboards received the appropriate suffix; closure was not far off. The lightly-used stop was finally removed from the scheduled passenger timetable on 16th July 1933, after a quiet life. Thereafter, the site survived as a ghost station for the next quarter of a century, the buildings finally succumbing during the mid-1960s. Passenger services had since ceased along the line in August 1953, the ex-SER’s route having won the day, but goods traffic remained. Freight was concentrated on the West station over Central; the latter had little capacity for handling large goods formations, it comprising a highly restricted yard behind the ‘’down’’ platform. Closure to all traffic came on 24th March 1968, and today only the tunnel to the north east of the station site remains as a monument to the railway which once passed through Rosherville.